In ancient times, the Turkish people migrated from Mongolia in northern Asia. The Mongols were a nomadic people who lived in yurts, round tent-like structures that are easily moveable. The people needed something to keep the yurt warm, so they knotted carpets. (The oldest carpet discovered is thought to be around 1000 years old.) Once they settled down instead of moving constantly, the Turks started producing finer carpets. 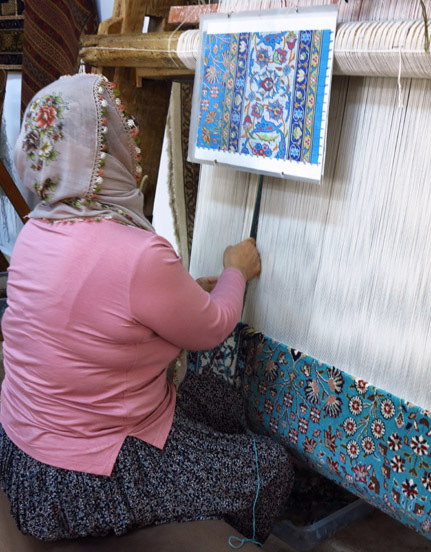 Turkey produces fine-quality silk to use in making rugs. The first carpets were wool, then cotton was added. Later silk arrived from China, and eventually Turkey began producing its own silk. 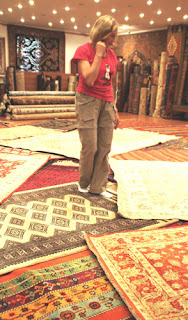 Today Turkish carpets, along with those from Persia (Iran) are considered the most prestigious carpets in the world. and preserve this ancient skill. 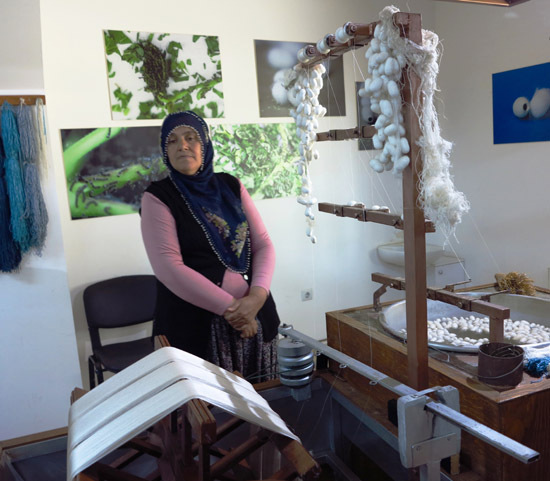 The problem is that knotting carpets is a dying art. Few young women are willing to learn the delicate and tedious skills, which must be done without error. Since beautifully crafted rugs are the pride of Turkey, the government began opening schools to teach ancient weaving techniques to willing learners. 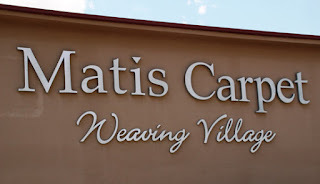 On our visit to the Cappadocia region of Turkey, we learned more about how these rugs are made at the Matis Turkish Rug School in Goerme. We saw silkworm cocoons in a tub (shake them to hear the rattle of a live silkworm inside) and saw how a strand comes out of each. Raw silk has 300 filaments per strand; in fact, it is so strong it will cut granite. To complete the workmanship, only natural dyes only are used for coloration. 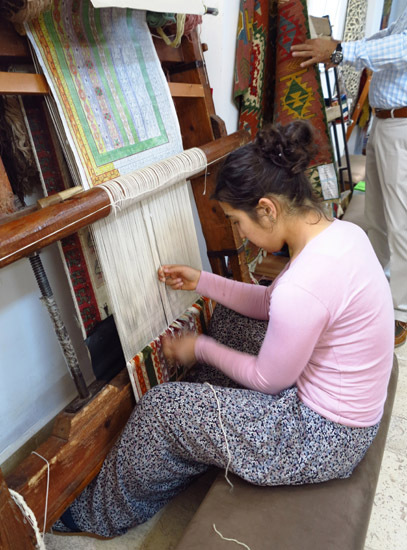 Schools become factories producing handmade rugs. To start, rugs have 10 knots per centimeter. Finer rugs may have up to 450 knots per inch on both front and back of the rug. Angora is the best wool, and 300 knots per square inch is the maximum number that can be done on wool. Rug makers work from a pattern and must have nimble fingers to tie the tiny knots in the precise locations and colors. If a mistake is made, the work must be completely undone and then repeated to perfection. Dozens of beautiful rugs in a variety of styles, colors and designs were spread on the floor, and we were invited to touch them, even walk on them. So, of course, I did, including a purple rug just like one custom-made for Elton John. Meanwhile, I sipped on raki, a strong, anise-flavored milky-looking alcoholic drink which I diluted with water. Of course, the school/factory has plenty of carpets, large and small, for sale. 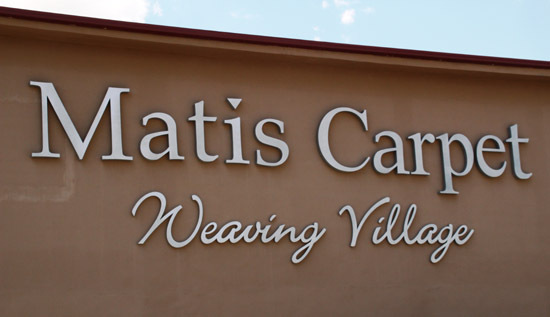 Depending on complexity of design, fabric, and number of knots per square inch, even wall-hanging sizes can be museum-quality collector's items. Because I love and admire handmade things, it’s not surprising that I found a beautiful rug I could love, but I did not buy another one. Since I already have three Turkish rugs it seems I have enough heirloom pieces. So interesting!! We had no clue the entire rug would have to be undone if a mistake is made! Such an incredible art form and it's sad it is dying out! I always love learning how things are made--so interesting! The carpets are beautiful as well, so that's a great plus! What an intersting experience.I was in Istanbul years before but I just looked at sights. What a great idea to open schools to train young people! The carpets truly are amazing. I sat through a demonstration when we visited Turkey in 2001, and the finer pieces with more knots per inch are very beautiful! I regret not buying one! I'm glad they want to preserve this beautiful art. It must take so much patience!! I remember having a small loom when I was a kid and getting so frustrated. It must take a lot of dedication to create the pieces there. So interesting!! I'm so glad to hear that the government is taking steps to train the new generation so that the art form doesn't completely die out. It's so easy to admire these beautiful rugs and not appreciate the dedication and time which goes into crafting each one. Thanks for this post! What a fascinating history! I love learning about local arts. I think I may have ended up going home with Elton's purple rug! Too bad it's a dying art.. Seems like a neat process. I wonder if a 1000 year old carpet is worth anything today! ?